The bad news is that Rizzoli has just come out with a spectacular new book, Stickers: From Punk Rock to Contemporary Art, and I didn’t write it. The surprising good news is that my GWB “I’m sorry” sticker was included on page 230 in the book’s Sociopolitical chapter. 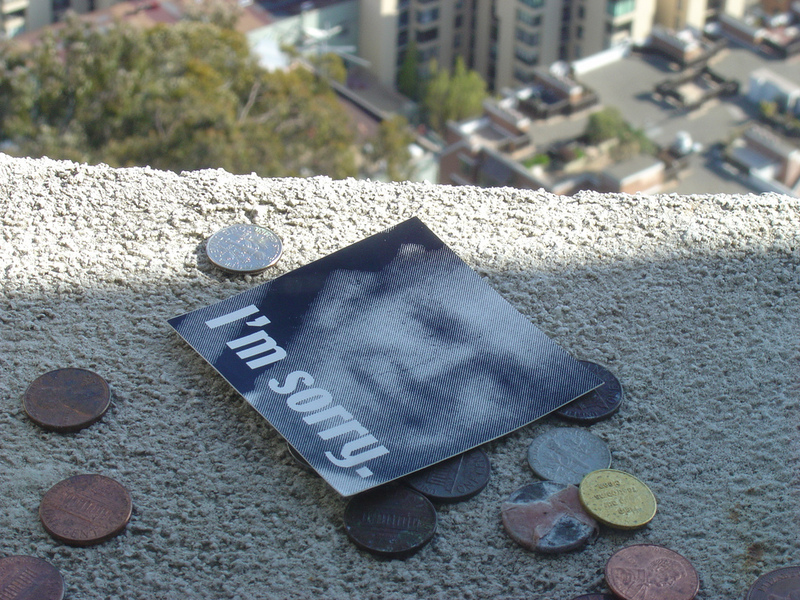 Here is one of the stickers that I left on the ledge of the Coit Tower in San Francisco in 2008. On the other hand, I do think I have a different angle in that I hope/plan to do more visual analysis in my writing than what I’ve seen elsewhere in other sticker publications. Milton Glaser’s Design of Dissent publication is still the closest parallel I have found regarding my sticker project. Ha. Stickerkitty. Milton Glaser. Dream on, little kitty, dream on. It’s good to have a fantasy life, tho, isn’t it? Kudos to getting in the book, Sticker. It’s frustrating to see that book there, but perhaps it indicates a growing audience for your work…?